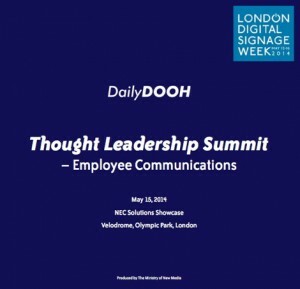 Over 140 people have now registered for our ‘Employee Communications‘ Thought Leadership Summit which takes place on Thursday May 15 co-located with the 6th NEC Solutions Showcase during ‘London Digital Signage Week‘. Heather Wagoner, Head of Internal Communication and Engagement with the London Underground, will present ‘Employee Communications: Influence @ Work. Identify the influencers and create messages that change minds’. Peter Critchley, Managing Director, Beaver Group will explain how in a media-rich world, reaching your employees and achieving message retention is an increasing challenge. His talk ‘Contextualise Your Employee Communications’ will explain how understanding the behaviour and media consumption habits of your audience is critical, and how it has a direct impact on how successful your communications strategy is. and Cathy Brown , Executive Director, Engage For Success will round off the day for us as she highlights simple enablers of engagement, along with the barriers to engagement and some straightforward tips that you can use immediately to start making a difference in your organisation. Registration (which is FREE) can be found here. This entry was posted on Monday, April 28th, 2014 at 13:04 @586 and is filed under DailyDOOH Update. You can follow any responses to this entry through the RSS 2.0 feed. You can leave a response, or trackback from your own site. I’m thrilled to see this event happening and appreciate DailyDOOH’s support. Hopefully this will lead to similar events around the world to showcase the great work being done INSIDE companies with digital signage. Thanks to those who attended the conference, I hope you found the Gatehouse State of the Sector Report presentation useful. Stay tuned for the 2014 report late in the year to see how things have moved on!